The following is a description of my boat: 1993 Sea Pro 220 Walk around Cuddy Asking price - $6,000 Length � 21�-6� Beam 8�- 6� Draft �2� Wgt. 2900lbs, hull-fiberglass, color-white Commentary:A true BARGIN! 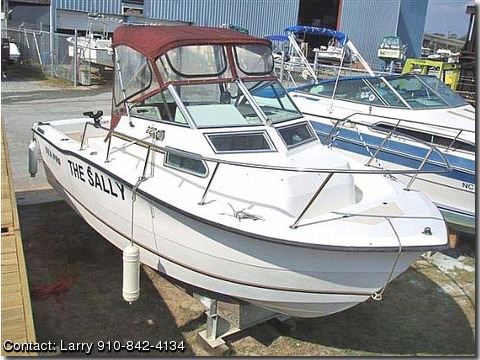 One owner, bought new from dealer in 1996, always rack stored at marina, regular yearly winterized & summer prepped, always regular maintenance of plugs, oil, filters, hull cleaning, engine fresh water flushed when used. Custom made red canvas top completely enclosed with roll-up windows. Engine Specifications: Make: OMC/Cobia 5.0 V-8 Model- I/O single engine Power: 200hp Fuel: gas Fuel Capacity: 132 gallons Mechanical Equipment: Automatic bilge pump Wash down system 72 qt, aerated live fish well Accommodations: Spacious cabin with headliner � for storage or sleeping Cabin light, rod storage holders, lockable door 2-fixed front windows, 2-side sliding windows cabin cushions & cushions for 2 �pedestal adjustable chairs Electronics & Navigational Gear: SiTex Loran XJ9, Sitex color screen depth & fish finder, VHF Shakespeare radio Electrical System: 2 enclosed battery components, panel controlled running lights Deck & Hull Equipment: Stainless steel walk around rails & steering wheels, covered instrument panel, forward anchor locker, 2-pedestal adjustable chairs with foot rests, cockpit lights, deluxe non-skid deck, heavy duty gunwale molding, self bailing cockpit with 2 deck drains.